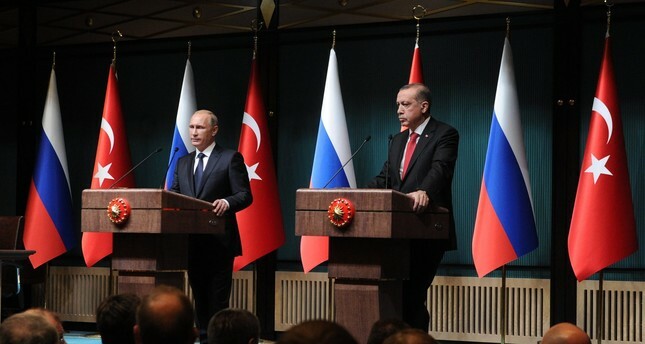 President Erdoğan and his Russian counterpart Putin speak at a press conference after their meeting in Presidential Palace, Ankara, Dec. 1, 2014. President Recep Tayyip Erdoğan and his Russian counterpart Vladimir Putin met in Sochi on Monday to discuss the future of Syria and set a joint course for the war-torn country. The Syrian civil war, which has cost hundreds of thousands of lives and displaced millions of people, seems to be winding to an end as Daesh has been pushed out of all the cities and settlements and with the establishment of no-conflict areas with the cooperation of Turkey, Russia and Iran. Russia has supported and saved the Bashar Assad regime, while Turkey has supported Syrian opposition groups bent on toppling the Damascus regime. Yet, this has had benefits for both Ankara and Moscow as they have managed to use their leverage on the warring sides and thus have created pockets of lasting ceasefires around the country that seems to have led to a general reduction of clashes across Syria. Cooperation between Ankara and Moscow has been the golden key to pushing through a peace process in Astana with the cooperation of Iran. The Americans have limited their involvement in Syria to an all-out fight against Daesh and have supported the People's Protection Units (YPG) and the Democratic Union Party (PYD) – both affiliates of the PKK terrorist organization, which is waging a secessionist war inside Turkey. The Americans provided heavy weapons to the PKK in northern Syria much to the strong opposition of Turkey. The PKK has taken over the Arab city of Raqqa and now Iran says the Kurds have to vacate Raqqa and all the areas they dominate east of the Euphrates and hand them over to the Assad forces. In light of all these developments, now Turkey and Russia are discussing what happens next in Syria. No one opposes the fact that the territorial integrity and sovereignty of Syria has to be preserved in any final political solution. This closes the doors to division of the country. So under these circumstances can Assad, who has the blood of so many Syrians on his hands, stay as if nothing has happened? This is the crucial question Putin and Erdoğan are pondering. This is not an easy question to answer. Can Erdoğan stomach any deal that helps Assad survive? And can that deal be just and lasting, as those millions who suffered Assad's atrocities are demanding justice? The sides need time to develop solutions and offers for a lasting deal. Apparently the two leaders will follow up their Sochi meeting with a meeting before the end of November. Besides all this, the Russian and Turkish leaders are discussing positive developments in bilateral ties, cooperation in the defense industry, energy projects and boosting trade. What is interesting is that Erdoğan and Putin are meeting regularly and frequently. Thus, they are ironing out any differences that may arise between the two countries. This is a very healthy turn of events. Shouldn't this set an example for the Americans? Shouldn't Trump and Erdoğan meet as frequently as Putin and the Turkish leader to deal with the outstanding issues between Turkey and the U.S.?